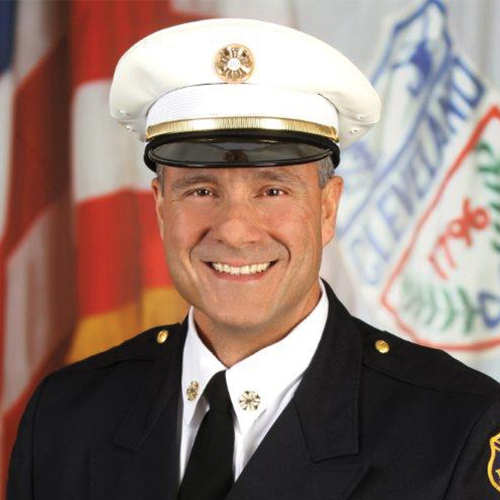 Angelo Calvillo was appointed to the position of Chief of the Cleveland Division of Fire on April 6, 2016. Chief Calvillo is the first Hispanic Chief in the history of the Division. He has made it evident in his 28 years of service that he is dedicated to providing quality service to the residents and visitors of the City of Cleveland. Chief Calvillo has worked in multiple disciplines of fire service, including the Fire Prevention Bureau, Hazardous Material Response, Director of Training and Fire Suppression. Chief Calvillo was also involved with the Cuyahoga County Regional Hazardous Material Team and the Joint Hazard Assessment Team. The Chief has been a functioning paramedic since 1996 and is proud to say that he started the first paramedic pumper.